A respected economic study by researchers at UCLA says there are a record number of people with jobs in the East Bay. The same study, called the Anderson Forecast, indicates Silicon Valley is very close to topping the number of jobs it saw during the dotcom boom. Santa Clara County is within 2 percent of its record job numbers set back in 2000. 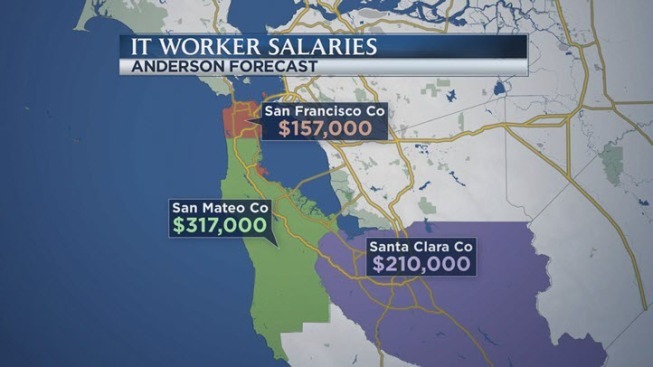 As for salaries, looking at tech jobs alone, the numbers are astounding: The average salary of an IT worker in San Mateo County is $317,000, according to the report. That's average – not median – and it's the highest in the nation. The average tech worker’s salary in Santa Clara County is $211,000; in San Francisco County it’s $157,000. Statewide, the total number of jobs is 3.6 percent higher than the previous employment peak set in July 2007. The entire report is posted on UCLA’s website.